Hoy por hoy, los profesores y estudiantes de inglés como lengua extranjera, buscan la práctica realista del idioma, por lo que muy conveniente adaptaría a las situaciones de la vida cotidiana, tanto en el trabajo como en las experiencias personales diarias. Este libro pretende dar a los estudiantes una experiencia didáctica, con una colección de casi 1.000 PREGUNTAS PRÁCTICAS de situaciones reales, las cuales han sido cuidadosamente elegidas por el autor sobre muchos temas, para que el estudiante pueda obtener un conocimiento razonable del inglés. Todays teachers and learners of English as a second language are always looking for realistic practice of the language which is convenient, and adapted to real life situations for both work and personal life experiences. This book contains a careful collection of almost 1,000 PRACTICAL AND SITUATIONAL QUESTIONS over a wide range of different topics in order to help both the teacher and the student obtain realistic practice of the English language. 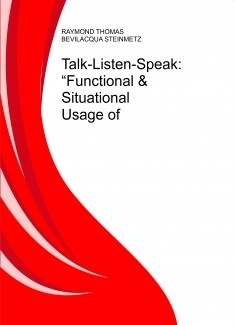 Topics have been carefully chosen in order to give the student practical learning experience in answering functional questions which help to stimulate and maintain realistic conversations with adults in a wide variety of different circumstances for work, home and play. A sampling of some of the topics covered in this book include computer technology; creative thinking; educational experience; environmental and social issues; family life; food and dining; gatherings and meetings; holiday events; human development and life stages; human relationships and society; knowledge and opinions; leisure time; likes and dislikes; modern life and lifestyles; motivational skills; personal and professional life; personal beliefs; personal native culture; personal preferences; places and events; time management; travel experience; U.S. culture; visitors and guests; and work skills and professional experience.